China is employing a foreign policy strategy in Africa that is both an inherent part of and intertwined with Beijing’s foreign policy doctrine. Its main aim is to turn the African continent into China’s strategic asset, whose purpose would be to grow PRC’s political and economic might and enable China to position itself as a superpower. In Beijing’s eyes, Africa is rich in valuable resources and is quite a capacious vast market, with a population of 1.2 billion people, for its goods, the continent is also one of the largest recipients of Chinese investments. Long-term plans include transforming Africa into a manufacturing zone, that China, having invested on a large scale in, could move its production facilities to, in order to be closer to sources of raw materials and labor. Ultimately, this will allow China to free itself of old technologies and clear the path for the fourth wave of innovation. Part of this strategy includes PRC’s interest in transforming Africa into a stable peaceful zone because only such a scenario would justify large-scale investments in this continent, and ensure steadfast sales of Chinese goods there. In addition, China believes that it should not meddle in African internal affairs or participate in military interventions, as do Western nations in order to reach their own political and economic goals. China’s priority is to safeguard its interests by taking part in numerous peacemaking missions in the continent and thus guarantee security of its investments. In practice, this means that China has become one of the most active participants, among the permanent members of the United Nations Security Council, in the operation to maintain peace in Africa. As at 30 June 2017, 2515 Chinese military personnel have participated in peacemaking operations in Africa. And as far back as 2015, the President of the People’s Republic of China Xi Jinping announced that he was planning on increasing the number of his peacemaking troops to 8000 people. The truth is that the Chinese do not take part in military operations and instead are part of supply units. 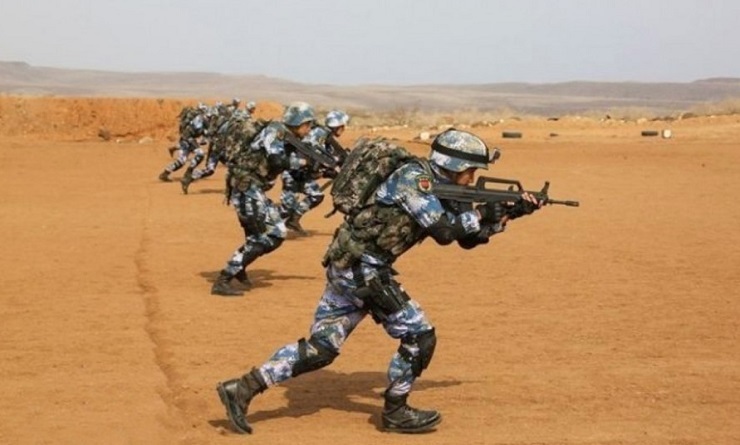 Still, the Chinese military presence in Africa began in 2013, as that year Beijing sent a 197-strong unit on a mission to Mali, and in 2015, 700 soldiers were deployed to Sudan, where China has substantial oil interests. At the same time, Beijing has been helping the African Union with regional security issues. In 2017 China gave a grant of 100 million US dollars to the African Union for the purchase of military goods for its peacemaking troops in Africa. Additionally, China aided the African Union Mission to Somalia (AMISOM) in combatting Al-Shabaab’s terrorist activities by spending vast sums on the preparation of Uganda People’s Defence Force and the Kenya Defence Force, which are actively involved in AMISOM. China also makes a significant contribution to the fight against piracy. From 2008 to 2015, approximately 16 thousand Chinese sailors, and 1,300 marines and special forces personnel were part of armed convoys. In 2015 a contract on building the first Chinese military base in Africa, in Djibouti was signed. Chinese military personnel have already been stationed there since 2017. According to the Chinese Foreign Minister Wang Yi, establishing this base “reflected China’s desire to play a constructive role in solving international and regional problems, and to create a safer, more stable conditions for its activities abroad”. The reasons behind these actions become clear, if one is aware of the fact that, at present, more than 2000 Chinese companies and over a million Chinese work in the African continent and need to ensure security. Admittedly, this Chinese strategy has, by and large, born its fruit. Trade turnover between Beijing and the African continent has reached $180-200 billion per year, while Chinese investments have increased to $100 billion since 2000. China’s main partners in Africa are Egypt, Nigeria, Algeria, South Africa, Ethiopia, DR Congo, Zambia, Angola, Morocco, Niger, Cameroon, Chad and some others. To further its interests, Beijing also uses means such as aid in the form of grants, interest-free and low interest loans, debt write-off, charitable construction projects, tax exempt import of certain African goods, sending experts to African countries, establishment of health centres and educating African students. All of this leads to China’s rapidly growing influence, the Chinese language is even becoming the language of cross-national communication between students, as is the case in Kenya. The China-Africa Development Fund stands apart from the other instruments used by China to extend its influence in Africa. In 2007 the China Development Bank provided the capital required to establish this organization, which is an investment fund, registered according to PRC’s Private Law. In other words, it is not a sovereign wealth fund, but the share of its capital provided by the China Development Bank makes state control over this institution possible. Unlike other similar Chinese organizations, the CAD Fund does not provide lines of credit but instead invests directly in Africa by financing business projects whose goal is to collaborate with African countries. The fund usually covers one third of the required capital, thus taking on the role of a passive investor. The remainder is financed by Chinese and foreign investors. In practice, the Fund invests capital in the energy sector, infrastructure, mining and processing of natural resources, and agriculture. These types of Chinese projects in Africa include the construction of more than 100 industrial parks, over 40% of which are already operational. By the end of 2016, 5756 km of railway lines, 4335 km of roads, 9 ports, 14 airports, 34 power stations and also 10 large and thousands of small hydroelectric power stations had been built!